In the last decade, the outlook of Indian-Mexican relations has changed dramatically. The two emerging superpowers have both made openly, friendly diplomatic pledges to boost trade, political and business links for mutual benefit. Steps such as the Agreement on Visa Exemption on Diplomatic & Official Passports (2005) and the Memorandum of Understanding on Cooperation in SMEs (2006) were indicative clues in the trajectory of the two countries who saw a high point in diplomatic relations in 2007 with the agreement of the Privileged Partnership in 2007. Since this date, there has been a threefold increase in bilateral trade between the two countries, with estimates suggesting that by 2020, the current figure of just over USD$8 billion in bilateral trade will have swelled to over USD$10 billion. In the first part of our exclusive 4-part series on Indian-Mexican business opportunities, we looked at the exciting comparisons that can be found in the respective ceramic industries. In part 2, we will look at a far more established and traditional trade opportunity- the oil and gas sector. This article will introduce in further detail the similarities between the economies of the two countries looking at the already blossoming oil and gas trade, whilst also looking at the opportunities for improvement that are available from an investment perspective. Trade of oil and gas between India and Mexico is already a firmly integrated and established trade relations. Aside from both boasting incredibly rich culinary and cultural heritage, India and Mexico have a lot in common. Both countries are emerging from the pack of their respective regions and are showing similarly impressive and stable rates of growth. Both countries are growing at impressive speeds. India is currently the 7th largest economy and is projected to be the second largest economy, behind China, come 2050. In 2019, the rate is expected to increase by a further 0.4% to 7.8% GDP growth from its current rate of 7.4%. As well as real-term improvement to the economy, there have been significant improvements to the country’s economic infrastructure with notable developments in terms of transparency and ease of business. The development of a common market between the 29 states of India cracked down on significant amounts of corrupt behaviour. Leveling out the tax requirements in each state, as well as the hugely controversial decision to remove the two largest notes of the Indian currency, were clear efforts to clean up the Indian economy and reduce the corrupt practices that have slowed the countries development. The reward has been sweet and effective: Since 2014, India has jumped 20 places in the World Economic Forum’s Global Competitiveness rankings to achieve an impressive 40th position. Despite India being a few steps further towards achieving its superpower status and living up to its title as a BRIC country than Mexico is to fulfilling its potential as a MINT nation, Mexico’s overall economic prospects are hugely impressive. The country is growing at a rate of roughly 2.5% a year and is expected to be the 7th largest global economy in the world by 2050. Analysts are pointing to a recent refreshing in relations with the USA and the apparent salvaging of the North American trading future as a crucial factor for the country’s long-term prosperity. 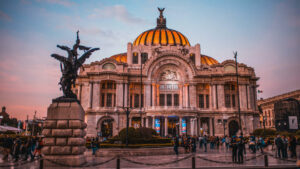 A report by OECD points to the huge potential available in Mexico which can be achieved largely through governmental policies that tackle a lack of investment, provide a more inclusive platform and root out corruption. Many feel that the inauguration of AMLO at the turn of the new year will provide the exact catalyst needed to kickstart a new era of Mexican prosperity. It is incredibly important to state one fact: Trade of oil and gas between India and Mexico is already a firmly integrated and established trade relations. Many diplomatic plays have been made in recent years which are demonstrative of the determination to improve trade in this region. In 2015 Dharmendra Pradhan, the Indian Minister for Petroleum and Natural gas made an official visit to Mexico whilst more recently, Mexico supported India’s bid to become a member of the Nuclear Suppliers Group in a more emphatic gesture of support and collaboration to the Indian energy cause. The numbers are already impressive too: In 2017, over USD$2.5 billion worth of Mexican crude oil was bought by India, representing a growth of nearly 70% from 2016. It means India is already the 3rd largest consumer of Mexico’s crude oil. What is hugely promising is that the potential for Indian trade to grow in this field is so evident and present. Firstly, in spite of all the bilateral agreements and friendly cooperation that Mexico and India share, such as a ProMexico office (the Mexican governmental branch which aims to promote Mexican investment and trade) being present in New Delhi, there is no direct aviation or shipping route between the two countries. This means that the actual process of delivering the raw materials from Mexico to India is slow, bureaucratic and complex. Were a company able to speed up this process, it may facilitate a far, far higher percentage of Mexican crude oil being sold to Indian bidders. India is the 3rd largest consumer of Mexican Oil. A second factor which should inspire hope for all potential investors is the scope of oil and clean resources that have yet to be reached and tapped into. Already in the top 10 for clean energy savings and production, the overwhelming truth is that the majority of Mexico’s energy potential has yet to be realised. In terms of oil, there are known reserves that equate to 26 billion BOE (Barrels of Oil Equivalent) whilst experts estimate that there are 113 billion BOE in prospective resources. In terms of renewable energy resources, there is an abundance of space and opportunity for foreign investment. According to leading wind energy expert Ralph Wagner, quoted in the Mexico Energy Review, over “50% of the best resources” are yet to be “exploited”. The message is clear and simple. Although there is already a lot of trade that is successfully completed in the energy sector between India and Mexico, as demonstrated by the numbers above, there is room for infinite growth with more innovation and creative planning on how to profit from the naturally rich Mexican resources. Are you an Indian businessman or woman with an innovative plan that you want to get started on right away? If you are feeling inspired to join the Mexican energy and oil sector then you are on the right track! Biz Latin Hub Mexico is the perfect team to assist you in navigating the complicated and at times, daunting, Mexican market and would be delighted to organise a consultation to discuss any of the back-office services that we provide. Please get in touch with the Mexico Country Manager Alex Mahoney at [email protected] with any questions and queries.